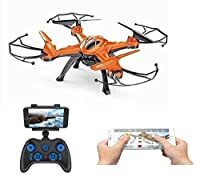 Function: 360 degree stunt flip, headless mode, hover function, one key landing/taking off, Forward/backward, Sideward flight, urn left/right/up/down, aerial view, photo/videos. 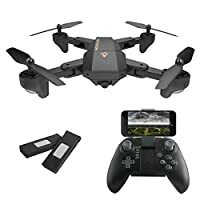 SYMA X22W is a portable app controlled drone with camera. You are able to control it with your smartphone or tablets with one simple touch. The waypoint control allows your drone to autonomously pilot and moves in the direction that you draw on the phone. Simultaneously, the FPV Live Stream function transmits what drone captures with its camera back to your phone in the first person view, and then you are able to explore the view that you're unable to see. Other than that, you can control it in the gravity control mode by tilting your phone in all directions. 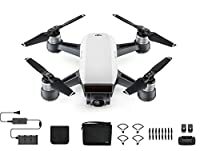 You don't need to worry about the loss of direction problem of the drone once you enter the headless mode, it will make it flies in any directions and follows the operation on remote control or your phone. There's another amazing feature about it is the 360 degreeÂžflip over that it manages to do all kinds of tumbling patterns that you can imagine. 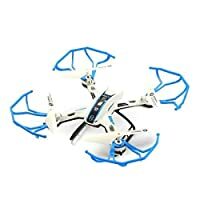 The high grade plastic material prevent it from wearing when the dropping or collision happened and the LED navigation light makes it flyable at night.